Known locally as the Ross Canon, the Ross 15 Pound Field Gun is an important element of the cultural heritage of Ross. The gun has a significant heritage through its historical context, technological design, and association with Tasmanian military units. Significant not only as an object, but in its contribution to the sense of place and aesthetic quality of the town. 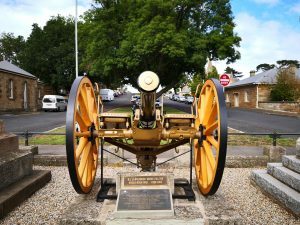 The history of the Ross gun starts with the New South Wales ‘A’ Field Battery which is the oldest permanent unit of the Australian Army. It was initially formed in 1871 as part of the New South Wales Defence Forces. In 1885, it formed part of the contingent sent by the NSW Government to the Sudan to avenge the death of General Gordon. On 14 July 1899 Queen Victoria approved the title Royal Australian Artillery for Victorian, Queensland and New South Wales Field Artillery Units. 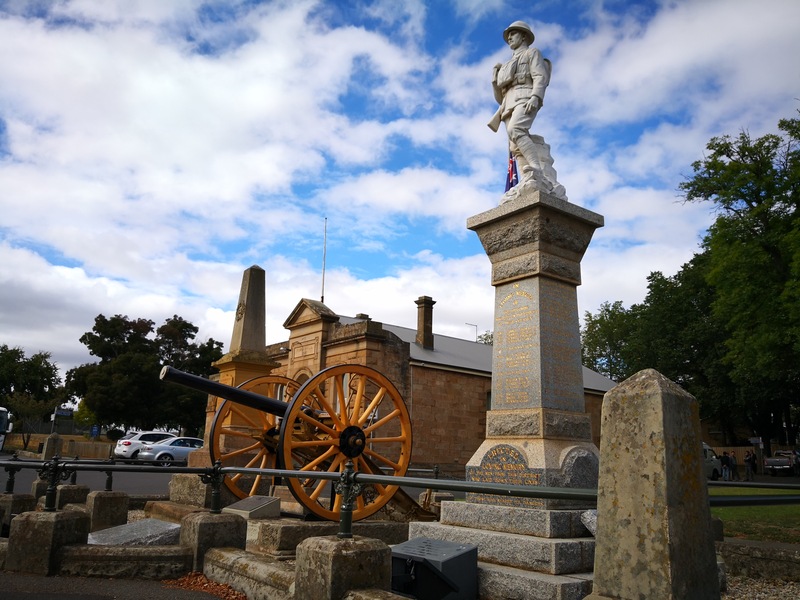 It was not until 1902 the Field Artillery units of the other States were to receive the Royal title and it was at this time that all Artillery units received the title Royal Australian Artillery Regiment. In December 1899 ‘A’ Battery of the New South Wales Royal Australian Artillery was sent to South Africa as part of the Second NSW contingent to the Boer War. The 15 pounder guns were sent with the contingent. The Battery remained in South Africa until August 1901 when it embarked for Australia. Its strength was 7 officers, 170 other ranks and 148 horses, 6 guns, 6 wagons and 6 carts. Five men were veterans of the earlier Sudan Contingent. Due to sickness and the resulting invaliding of members back to Australia a Draft of 44 reinforcements and 19 horses were sent in 1901. At this time ‘A’ Battery consisted of six guns, two were on New South Wales Special Carriages and the other four were on Mark 1 carriages. The left section joined Colonial Crabbe’s column in the Orange River in operations against De Wets Commando and was instrumental in capturing his guns. This section was later attached to Lt. Colonel Grenfell’s Column in operations around Graaff-Reinet. The right section was also re-allocated in November 1900 to operations around Vryburg and during one action one of the two guns in this section fired 190 rounds and suffered a fatality when Gunner Gowing died of wounds. The Battery returned to Australia in 1901 and was renamed ‘An Instructional Cadre’ in 1903. In 1904 the Battery received a Kings Banner from King Edward VII, the only Australian artillery unit to receive this honour. These colours are currently laid up at the Australian War Memorial. 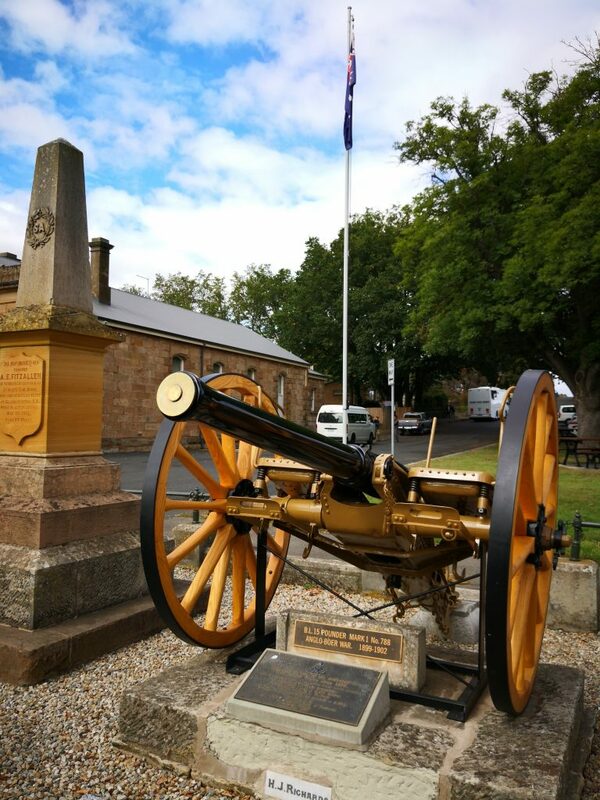 In 1912 both the 15 pounder gun at Ross War Memorial and the 15 pounder gun now at the Sheffield RSL were transferred to the Saluting Battery, Queens Domain, Hobart. It is not known when the guns were transferred to these respective towns or the reasons for the transfer. 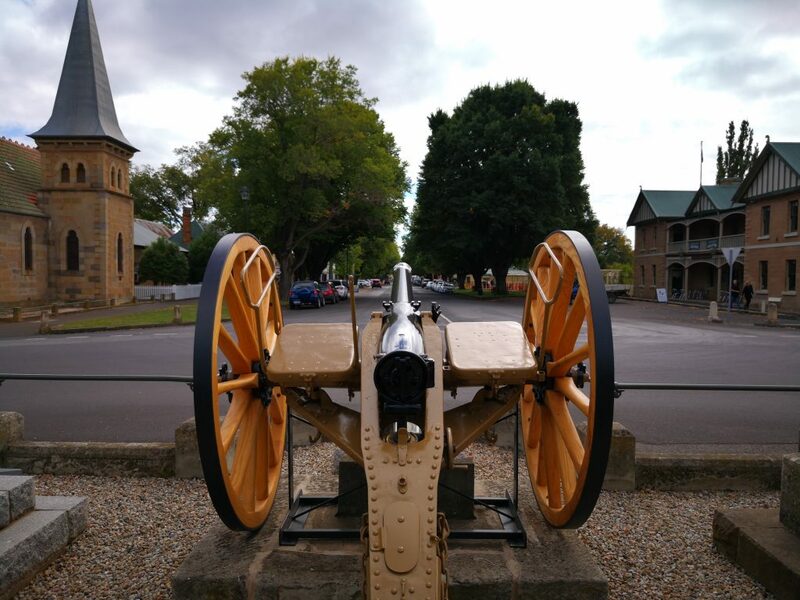 The gun provides a link to the use of field artillery during the Boer War and the involvement of Australians in that conflict. Covering the pre-Federation and early Federation periods, it exemplifies the acquisition strategies of colonial governments and the early defence policies of the Commonwealth Government. It is believed to be one of only two surviving examples of this type in the world and is the only one of its type in Tasmania. The 15 Pounder Field Gun is located at the Ross War Memorial, at the intersection of Bridge Street and Church Street. The 15 Pounder allows a 15 pound shell to be fired. An interesting design feature of the 15 pounders was the multi-purpose seats. Situated on the axletree are two boxes with hinged lids. These boxes have spring mountings to absorb some of the vibration. The boxes served three purposes: as a seat for gunners travelling on the carriage and are fitted with loops for blanket straps to retain the folded blanket on which the gunner sat. The boxed lids, which were made of hardened steel, when opened served as shields to give some protection to the gunners. The interior of each box was divided into three sections. The outer sections had beech blocks that retained two projectiles (2 rounds of case shot in the right hand box and 2 rounds of shrapnel in the left hand box). Between the beech blocks was the tray that contained two cartridges in tin boxes. This ammunition acted as ready ammunition when coming into action whilst the gunner on the limber prepared ammunition to serve the gun. The 15 Pounder is on two wooded-spoked wheels with iron rims. The barrel carriage and wheels all appear to be original. There are a number of markings on the piece. At the end of the trail is the place and date of carriage manufacture, “R.C.D 1896 REG. No. C3353.” referring to the Royal Carriage Department at Woolwich. On the right side of the breech loading mechanism is the date and place of the barrel manufacture, “15&12 Pr. B.L 7 CWT I R.G.F. 1893 No. 788” referring to the Royal Gun Factory, Woolwich. On the top of the barrel is an insignia which shows Queen Victoria’s royal cipher: “HONI SOIT QUI MAL Y PENSE”, in a garter belt surmounted by a crown. This could be translated as “Let he who thinks ill there be shamed.” It is sometimes re-interpreted as “Evil be to him who evil thinks”. On the left trunnion, a stamp is inscribed: “R.G.F. 1896”. On the right trunnion, it states: “15 pr. B.L.I. No. 788 R.GF. 1896 15 pr 7 CWT 7.2.4”. On the carriage a small stamp shows: “A J.W”. Two plaques are attached at the foot of the gun. One reads: “B.L. 15 POUNDER MARK 1 No. 788 ANGLO-BOER WAR. 1899-1902”. The other reads: “This gun is one of six delivered to New South Wales circa 1898. Used by Australian Troops in their First Action outside Australia. Presented to Ross Township. Range 6,000 yards – 5,490 meters. Calibre 3 inch = 76.2mm. Weight of ammunition 14 pounds = 6.4 kg. Documented by The Artillery Historical Trust of Tasmania. Northern ranch. 10th Nov 1996”. 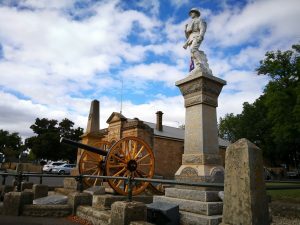 Source: Northern Midlands Council – Ross and Perth Historic Guns Heritage Management Plan.